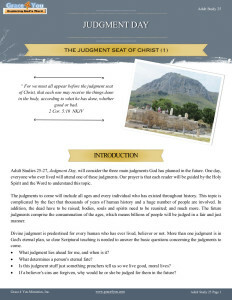 Study 25: Judgment Day – The Judgment Seat of Christ – Part 1 | Grace 4 You Ministries, Inc. Adult Studies 25-27, Judgment Day, will consider the three main judgments God has planned in the future. One day, everyone who ever lived will attend one of these judgments. Our prayer is that each reader will be guided by the Holy Spirit and the Word to understand this topic. The judgments to come will include all ages and every individual who has existed throughout history. This topic is complicated by the fact that thousands of years of human history and a huge number of people are involved. In addition, the dead have to be raised; bodies, souls and spirits need to be reunited; and much more. The future judgments comprise the consummation of the ages, which means billions of people will be judged in a fair and just manner. Divine judgment is predestined for every human who has ever lived, believer or not. More than one judgment is in God’s eternal plan, so clear Scriptural teaching is needed to answer the basic questions concerning the judgments to come. What judgment lies ahead for me, and when is it? What determines a person’s eternal fate? Is this judgment stuff just something preachers tell us so we live good, moral lives? If a believer’s sins are forgiven, why would he or she be judged for them in the future? Every human who has ever lived will be judged some “day” (Acts 17:31). “Look to Me, and be saved, All you ends of the earth! For I am God and there is no other. I have sworn by Myself; The word has gone out of My mouth in righteousness, And shall not return, That to Me every knee shall bow, Every tongue shall take an oath” (Isa. 45:22-23). The Apostle Paul reiterates this; “Therefore God also has highly exalted Him and given Him the name which is above every name, that at the name of Jesus every knee should bow, of those in heaven, and of those on earth, and of those under the earth, and that every tongue should confess that Jesus Christ is Lord, to the glory of God the Father” (Phil. 2:9-11). Each of us has an appointment with the Almighty. This is a monumental event, for our eternal destiny is at stake. There is no escape from being brought before the Lord in judgment, nor will anyone somehow be overlooked. It does not matter if one is an atheist, agnostic, Muslim, Christian, child, or developmentally disabled…. Every person will one day be judged by the Lord. All judgment has been given by God the Father to the Son, Jesus Christ: ” ‘For the Father judges no one, but has committed all judgment to the Son’ “ (Jn. 5:22; also 27). Considering the three judgments ahead, the Bible makes it clear they are all presided over by Jesus Christ. At first glance, it seems the Father sits on the Great White Throne: “And I saw the dead, small and great, standing before God, and books were opened” (Rev. 20:12a). In light of the fact the Apostle John wrote the books of John and Revelation, the reference to “standing before God” may be better translated “standing before the throne,” as the Greek Majority Text indicates. Thus, both the small and great will stand before the throne, when the books are opened. The immediate context indicates that Christ is the One on the throne, since He is the One from Whom the earth and heaven flee away (Rev. 20:11). The issue at each judgment is a person’s relationship with Jesus Christ, as will be explained more fully as we get into this study. We can be sure His judgment will be fair, true, and done in a just manner: ” ‘For true and righteous are His judgments….’ “ (Rev. 19:2). “For we shall all stand before the judgment seat of Christ” (Rom. 14:10b). “For we must all appear before the judgment seat of Christ, that each one may receive the things done in the body, according to what he has done, whether good or bad” (2 Cor. 5:10). The Judgment Seat of Christ (JSC) is the first judgment in the future; this is our appointed judgment. “Our appointed judgment” refers to the specific judgment reserved for believers of the Age of Grace (mid-first century until the Rapture). First Thessalonians 4:16b makes it clear this judgment pertains only to believers, those in Christ: “And the dead in Christ will rise first.” Believers who are already dead, and those who are alive at the Rapture, will take part in this judgment. The unsaved will be judged at a later date. 1 The judgments under discussion are those related to mass groups of people, dead and alive, bowing before Christ. These judgments relate to matters of eternal reward and damnation. This study is not referring to specific, limited, earthly judgments, like that of Babylon (Rev. 17:1).